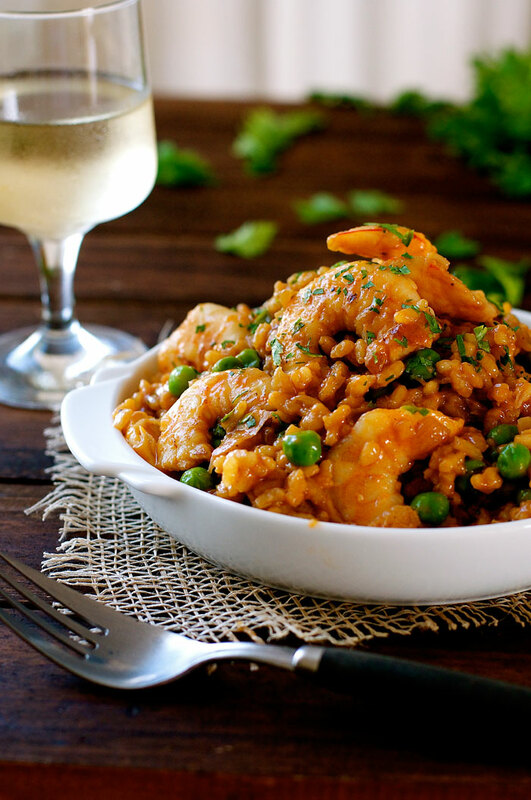 If you love prawns and risotto, you'll love this upmarket version that could be served in the finest restaurants. Peel the prawns and reserve the head and shells (Note 1). Use your fingers to coat the prawns in the garlic and season with a pinch of salt and pepper. Heat olive oil in a deep fry pan (or pot) over high heat. Add the prawns and cook each side quickly until just cooked through (See Note 3 for how to tell a prawn is perfectly cooked). Remove onto a plate and loosely cover with foil. Add the prawn heads and shells and white wine into the fry pan. Simmer for to 3 minutes until most of the wine has evaporated. Add the chicken stock and water, bring to simmer then reduce to medium high. Crush the prawn heads and shells using a potato masher (to squeeze out all the flavor into the stock). Simmer for 20 minutes, occasionally mashing the prawn heads and shells into the liquid. Strain the stock into a small saucepan – you should have around 1 ½ cups (don’t worry if it’s more or less). Add the chicken stock and tomato paste into the saucepan prawn liquid, and mix to combine. Keep warm on a low heat on the stove (covered). Return the fry pan to the stove with the olive oil and heat over medium heat. Add the garlic and sauté for 15 seconds, then add the onion and cook for 5 minutes until translucent and just starting to turn golden. Add the Arborio rice and stir until the grains are coated in the oil and slightly translucent. Add 1 cup of Prawn Stock and turn down the stove to medium low. Stir until the liquid is mostly absorbed. Repeat with remaining Prawn Stock, 1 cup at a time. Add the peas, then add 1 cup of hot water and stir until the water is mostly absorbed. Repeat as necessary until the rice is firm but just cooked. It will keep cooking a bit when you take it off the stove. Stir through the salt, pepper, butter and most of the parsley, then remove from the stove. The risotto should be very saucy when it is taken off the stove because the rice will continue to absorb liquid while it is being served. Serve immediately, garnished with the remaining parsley. as you pull the head away from the body. If the vein breaks, just bend the prawn and the flesh will pull apart and expose the vein. Use a skewer or small sharp knife and to "hook" under the vein, pull it up then use your fingers to gently pull it out. Then peel the shell off. 2. The more butter you use, the creamier the finish. into an “O” shape and will be tasteless and rubbery. 4. Traditionally, parmesan is not used to garnish seafood risottos (or pastas). However, I say do as you please! !